Good Start to 2011: Total sales are down due to the lack of inventory…..although prices are up for almost all GTA housing markets. The full report is linked below. Contact Karolina or Jarrod Armstrong for any questions. 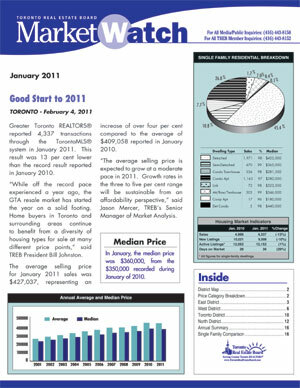 February 4, 2011 — Greater Toronto REALTORS® reported 4,337 transactions through the TorontoMLS® system in January 2011. This result was 13 per cent lower than the record result reported in January 2010.